Graduate Aptitude Test in Engineering (GATE): Graduate Aptitude Test in Engineering (GATE) is an all India examination that primarily tests a comprehensive understanding of various undergraduate subjects in engineering and technology. is an all India examination that primarily tests the comprehensive understanding of various undergraduate subjects in Engineering and Technology. 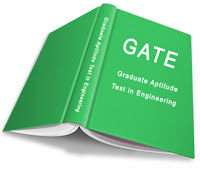 GATE is conducted jointly by the Indian Institute of Science and seven IITs (IIT Bombay, IIT Delhi, IIT Guwahati, IIT Kanpur, IIT Kharagpur, IIT Madras and IIT Roorkee) on behalf of the National Coordination Board – GATE, Department of Higher Education, Ministry of Human Resource Development (MHRD), Government of India. ” Discrete Mathematics ” by Tremblay and Manohar . ” Introduction to algorithms ” – Cormen etal ( CLRS ) for recurrence relations and asymptotics. ” Principles of Compiler Design ” , Aho , Ullman etal .